Unbelievably, my first child turned four today. She decided to have a gorilla birthday party about 10 months ago, right after I gave her a set of pictures from her third birthday party in a little album. She was looking at the albums from all her previous birthdays and thinking deep thoughts about the themes–kitty cats, monkeys, the beach. She really liked the pictures from the monkey party, especially the cake, so she decided her next birthday should be similar but different, and thus the gorilla theme was born. I can’t believe the idea still enchanted her after all this time, but she did not change her mind once. 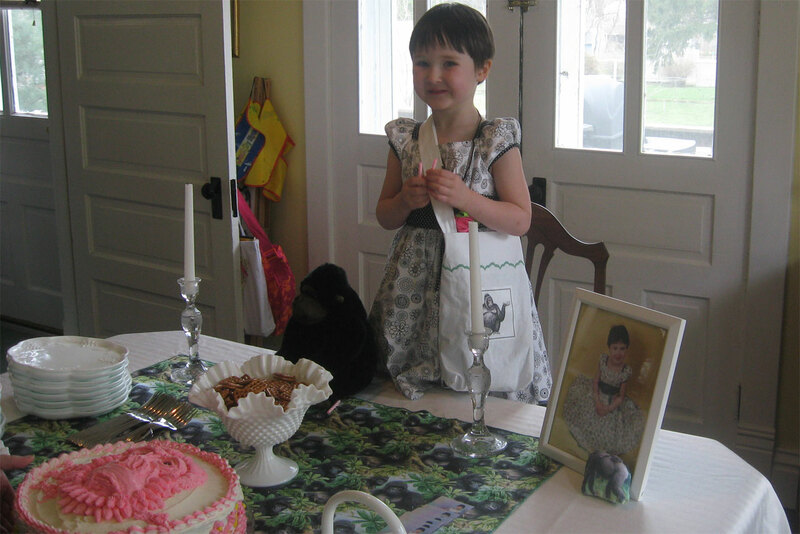 So in addition to the amazing pink gorilla cake done by Nana (color request by Dorothy), I made a gorilla tablecloth she can now use on her own little table and made little party favor bags for Dorothy and her cousins. Of course I actually did this right after Christmas, since I knew I probably would not get it done with a new baby in the house (great foresight, that!). 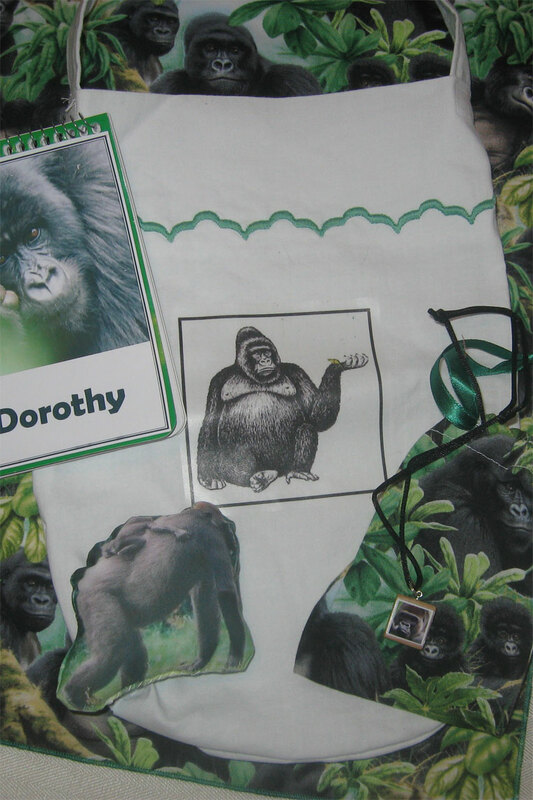 The favor bags are totes made from a green-trimmed thrift store sheet with an iron-on clipart gorilla, and are meant to be the girls’ zoo bags this summer so they can schlep their own snacks and water bottles. Inside I tucked a simple stuffed gorilla toy with a baby on its back (printable fabric), a notepad I embellished with a photo and the girls’ names, and a little drawstring bag containing a Scrabble-tile gorilla necklace. The bags were a hit, and Dorothy looked cute with her bag slung over her shoulder and her necklace on for the rest of the party. She got some very cute gifts, including a little desk for the living room near my sewing table so she can keep her own crafts organized and handy. She’d outgrown the drawer we keep for her supplies long ago. The amazing Aunt Molly also made a hit with a handmade mail pouch made of felt, containing little felt envelopes with address labels and stamps that Velcro on, and charming little felt cards for all occasions. Fun! I will be heartbroken when he’s old enough to pick out his own clothes. That’s really all I have to say. All morning Dorothy has entertained herself by “teaching” Worth tricks. She hops around and strikes fancy poses that seem to be a cross between ballet class, Fancy Nancy, and SNL’s Mary Katherine Gallagher (sorry, Dorothy). Fortunately, these antics actually seem to be entertaining to Worth, so it’s a match made in heaven. In this picture he’s making use of her handiwork, if not her lessons. 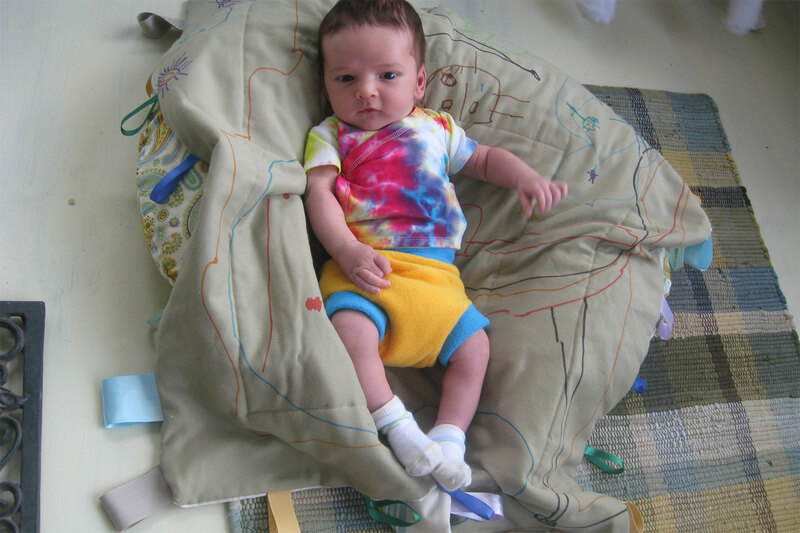 He’s lying on a playmat we made him before he was born, inspired by a project in SouleMama‘s book Handmade Home. Dorothy used fabric markers to decorate the fabric I used for the top. She took time and care to illustrate our family members and even our car for him, so he’d know all about his new life. My favorite part, which I don’t think you can see in the picutre, is that all the figures have big circles around them (kind of like saints?) that she will only tell me is their “power.” Cool! The mat has ribbon tags sewn all around the edges for his entertainment when he gets a bit older. Worth is also sporting a shirt Dorothy tie-dyed for him, and a soaker from Katrina’s Sew Quick pattern in fleece (made by me). He’s out of the extra-small diapers now and into our small stash, and these seem to be doing a much better job of not leaking. Hooray for no leaks! 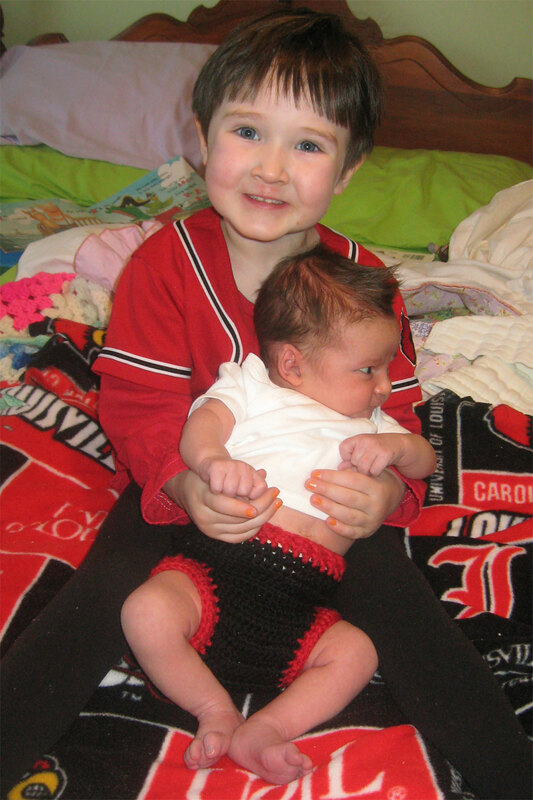 So Louisville lost last night, but not before we got the chance to deck both kids out in their Cardinals finery and snap a few pics. We took our evening walk through the neighborhood with them dressed like this (although Worth didn’t show, being in the mei tai) and someone commented on our “little guy,” meaning Dorothy. Oops! She’s been getting this a lot since she cut off her hair–the repeated gender mistakes might be the best insurance against her doing it again! Worth’s scary law school parrot gear (Dorothy re-named the Cardinal once she was old enough to recognize it, so we’ll probably call it that forever) was homemade. The crocheted hat is soft and cozy and actually sized for next year. I didn’t use a pattern, but it’s just a basic HDC hat with regular increases, and then I added extra little bitty rows on each side for earflaps. I bought the applique on eBay. His diaper cover is wool, this pattern, and works very well. So far wool seems to be a good choice for him since he’s such a heavy wetter. 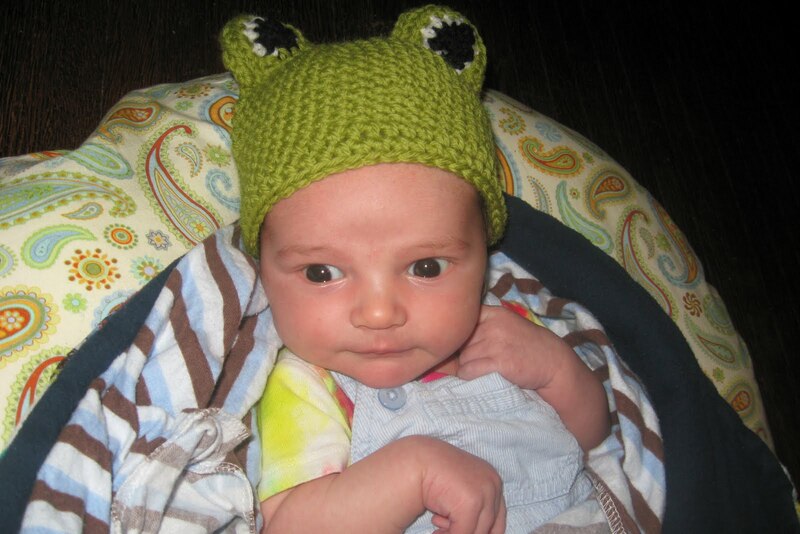 The newborn size looked huge to me when I was making it, but it fits him perfectly. 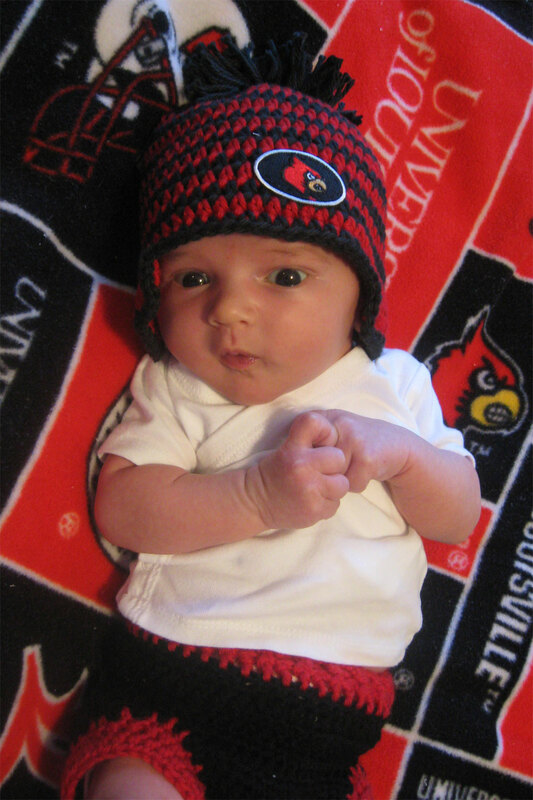 The blanket is just a cut of fleece with fringed edges and was Dorothy’s when she was our smallest Louisville fan. Two things about this picture. Well, three if you count my disclaimer about the baby weight. 🙂 First, I’m sewing again, hooray! Today was the first day I broke out the sewing machine since Baby was born, and I successfully finished this comfy knit skirt I’d cut out a few weeks ago. It’s stretchy and perfect for post-partum, and I think I’ll get a lot of use out of it this summer. It’s made on the same pattern as the bird skirt below (Simplicity 2758) but I didn’t bother with interfacing or anything, since the whole point of sewing it in knit was so that it would stretch. It felt good to be sitting at my sewing table again! Worth spent almost the whole time in the mei tai, but did agree to sit in his swing long enough for me to set the zipper. 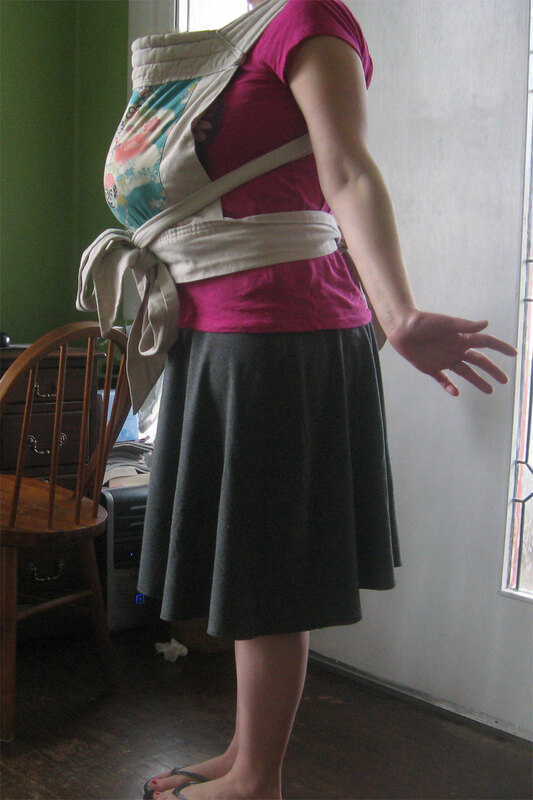 Second, the mei tai baby carrier. I’d like to make a public service announcement to nosey people everywhere: YES, MY BABY CAN BREATHE IN THERE, AND ACTUALLY, IT’S NONE OF YOUR BUSINESS ANYWAY. Here’s an article explaining why people armed with a very limited amount of information should keep their mouths shut to mothers who know more than they do. I don’t go around condemning mothers who carry their babies around in car seats (Google it, car seats are made for the car; they are not meant to be your baby’s permanent cage! ), and I really don’t appreciate the inquiries I’ve been getting about my kid’s airways while he’s happily tucked away close to my heart, thriving. Ok, off my soapbox now! 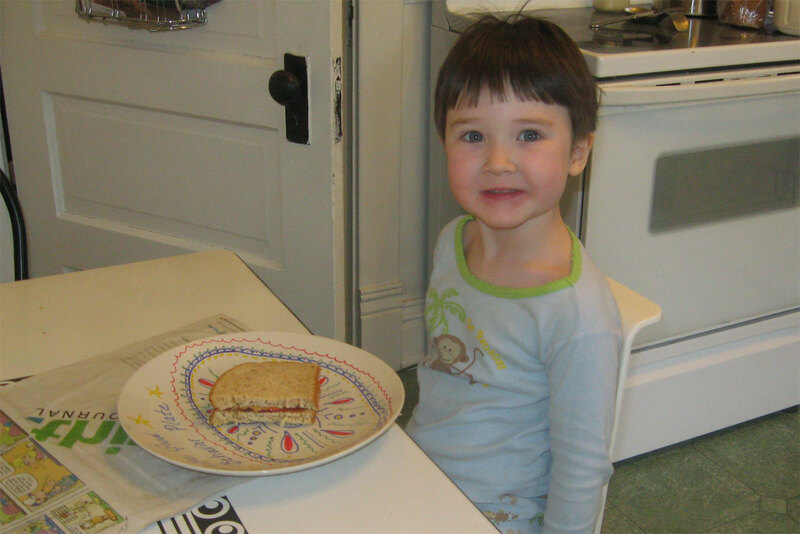 Life imitated art today at our house, as Dorothy and I recreated a treat from one of her recent favorite books. Pickles to Pittsburgh, the sequel to Cloudy with a Chance of Meatballs (no, we haven’t seen the movie), features an enormous chocolate chip cookie at the end of the fantasy and the reality portions of the story. 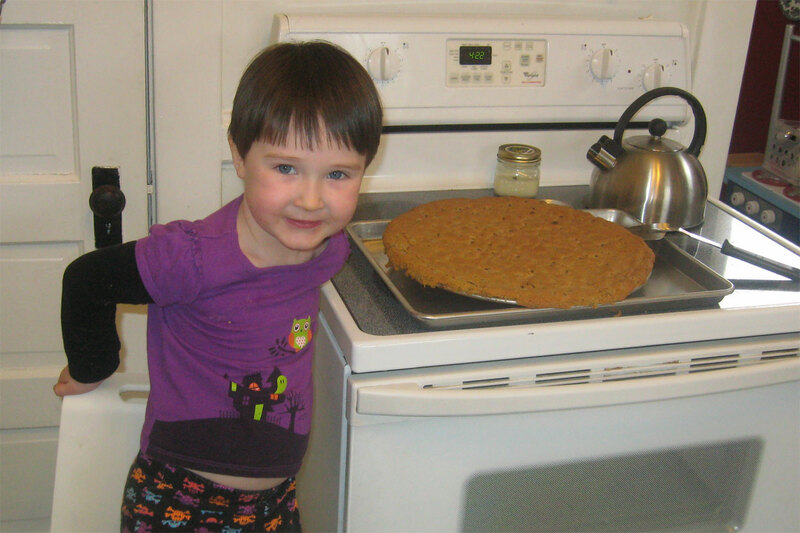 Dorothy has never encountered a pizza-sized cookie before, so today we baked one for fun. I’m not sure she was impressed that our cooking endeavor had a literary tie-in, even though we’ve read the book a zillion times at her request in the last week, but she certainly was all in favor of the biggest chocolate chip cookie she’d ever seen. Right before Worth was born Dorothy and I discovered a new mother/daughter craft. We acquired a couple packs of porcelain markers, which are like paint pens that you can use to write on dishes, then bake in your own oven. The results are food safe and dishwasher safe. We have several projects still in the works; these shown got interrupted by a baby then finally baked and completed yesterday. The plate Dorothy is cheesing over was my own work. Although I’m no marker artist, I made a simple colorful design and wrote the words “Good Behavior Plate” at the top of some Dollar Tree stoneware. It’s meant to be a household honor to eat off it at dinner, a treat only allowed to little girls who maintain good behavior all day. So far it seems to be highly motivating, and she proudly used it this morning (pictured) and evening. This mug was one of Dorothy’s projects. 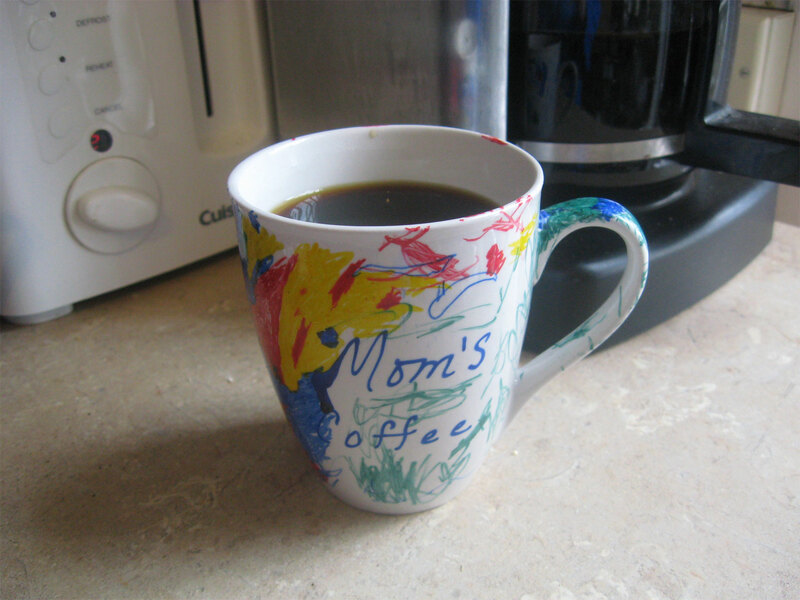 I wrote “Mom’s Coffee” and she decorated it for me–front, back and handle. It’s charming and I enjoyed using it this morning. The mug was also Dollar Tree stoneware, but we’ve also been decorating some cool thrift store finds. Porcelain pens are fun!